Abutilon theophrasti (commonly known as velvetleaf) is a summer-emerging, annual, broad-leaf weed native to Asia. 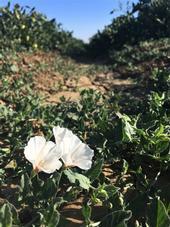 The species can be found mainly in the Central Valley (and mostly in the Sacramento Valley) in agronomic crop systems, along roadsides, in orchards and vineyards, and in other disturbed areas. Cotyledons (approximately 1/2 inch (12 mm) long and wide) are rounded to heart-shaped in appearance. 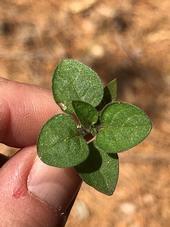 The first true leaves are heart-shaped with with shallow and rounded-toothed margins. Velvetleaf cotyledons, leaves and petioles are covered with fine, soft hairs (hence the name 'velvetleaf'). Growers (mainly pistachios) and crop consultants in the southern and western parts of the San Joaquin Valley have recently reported the spread of alkaliweed from low-lying saline or alkaline soils (including seasonal wetlands and floodplains) into irrigation ditches, orchards, and some agricultural fields (Figure 1). 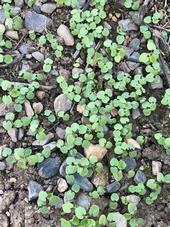 The summer annual weeds are starting to emerge and I am using this blog over the next few weeks to introduce readers to the seedlings of important species. Black nightshade (Solanum nigrum) is an annual (or sometimes a short-lived perennial) species that is common throughout much of the state inhabiting: tree and vine systems, agronomic and horticultural crop fiels, roadsides, gardens, and other disturbed sites. There is still time to register for the April 11th SJV Weed Science Extension Day at the Westside Research and Extension Center in Five Points (17353 West Oakland Avenue, Five Points, CA 93624). The meeting at the Westside Center will focus on agronomic crops, ROWs, and tree and vine systems. The session will also include hands-on weed ID and nozzle selection/drift management training. The meeting has been approved for 3.5 CDPR continuing education credits (other). 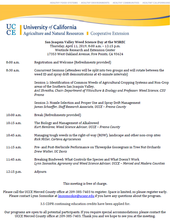 There will be TWO upcoming weed science extension days in the San Joaquin Valley this April. The first will be held on the 2nd of April at the Kearney Agricultural Research and Extension Center in Parlier (9240 South Riverbend Road, Parlier CA 93648) and the second will be held on April 11th at the Westside Research and Extension Center in Five Points (17353 West Oakland Avenue, Five Points, CA 93624). Are you a student working with weeds or invasive plants? Check out these scholarship opportunities! Lynn M. Sosnoskie: Thank you, Alexxis!! !